In today's financial landscape, having multiple credit cards is less a reflection of your financial acumen and more a reality of balancing existing debt and funding everyday purchases. As part of the POPSUGAR Insights 2017 Personal Finance Report, we surveyed nearly 2,000 women between the ages of 18 and 44 to ask them how they manage their finances and think about their financial future. Women under the age of 30 are 83% more likely to have more than five credit cards and 92% more likely to have between three and four cards, while women between the ages of 30 and 44 are 89% more likely to have no credit cards and 20% more likely to have between one and two credit cards. 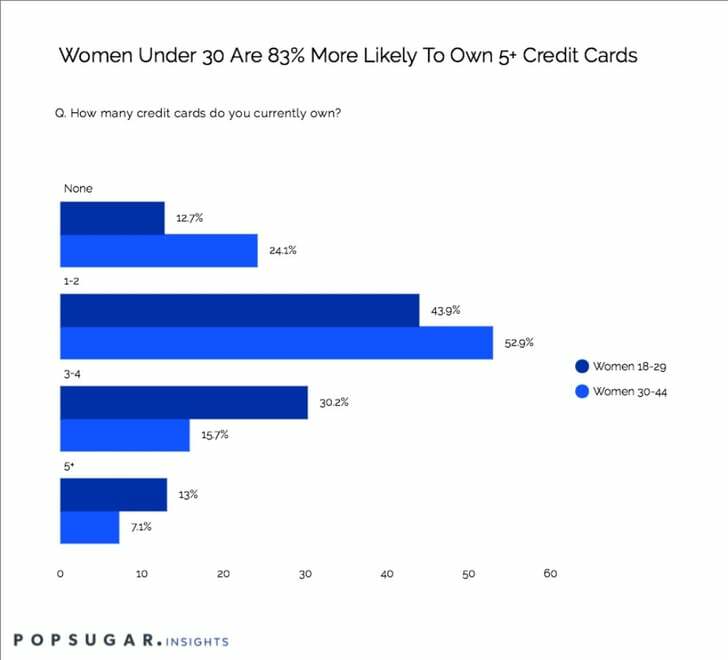 Overall, 44% of women under the age of 30 and 53% of women between the ages of 30 and 44 own a between 1 to 2 credit cards. Over 43% of women under the age of 30 have three or more cards, while 23% of women between the age of 30 and 44 own three or more cards. Combined with the average monthly balance that women keep on their cards, and the challenges around paying off the entire balance each month, owning multiple cards can be a sign that focusing on both short and long term debt planning could be needed, so marketers can help by creating content that educates women about how to manage credit card debt, how having established credit can benefit your overall credit score, or how to seek out low interest offers, obtain balance transfers, or set a long term payment plan.